It's Fun AND You get Awards, too! WHATEVER HAPPENED TO CRACKER JACKS? I know it's the day after Thanksgiving and most people have moved on to thinking about the next holiday and are out shopping today, but I'm still thinking about my blessings. A few years ago my husband started answering "Living the Dream", whenever anyone asked him how he was doing and I loved that response the first time he said it. It's so true. We are living the dream. I'm living the dream. My kids are living the dream. Not every day is lollipops and rainbows but that's part of life. Knowing there are ups and downs in life, that "this too shall pass", appreciating the good times, and just recognizing and KNOWING JOY is a profound blessing. I am blessed beyond belief; and I'm thankful for it. For about a year my youngest son begged us to buy him a corn snake for his birthday. He claimed a corn snake would be the perfect pet because they don't smell, are easy to take care of and don't cost a lot of money. Not to mention they're really high up on the "cool factor". I'm not opposed to pets, I love animals and my kids have had lots of them. There was the goldfish that lived five years (I am not joking! ), the tree frog that lasted two, not to mention our big fluffy dog, Daisy, that's been a part of our family for a couple of years now. No, I love pets. The only thing that bothered me about getting a corn snake is that they eat mice. I'm terrified of mice. We caught a mouse in our basement almost two years ago and I haven't been down there since. So, my son wore me down and we bought him a corn snake for his birthday in September. He named him Cornelius, and my husband ordered 240 frozen pinkie mice on the internet. They arrived at our door shipped in dry ice and packaged like little frozen hot dogs. When it was time to feed the snake my son broke off a pinkie, thawed it in a bowl of water and fed it to his snake. Trust me; I made sure I was out of the house when that lovely little event occurred. Cornelius died a month after my son's birthday. He was devastated. (I quietly pondered what I'd do with the 230 frozen mice I still had in my freezer. Hmm, Craig's List or eBay?) We had a funeral in the backyard with all the trappings; candlelight, a nice cardboard coffin lined with tissue paper for Cornelius while he rests in peace, beautiful eulogies were offered. I couldn't stifle a small giggle in the middle of my husband's moving, heartfelt words about how he had come to love Cornelius. It just seemed funny in a bad television sit com kind of way. My son heard me, turned, and looked up at me with tears in his eyes and I silently thanked God for giving me the words to explain to him that humor sometimes helps us get through times of grief. My son understood, wiped away his tears, went on to profess his love for Cornelius and vowed he would never forget him. It was no longer funny, my heart ached for him and I cried with him. Three weeks ago we got him another corn snake. He couldn't settle on one name so he calls him King Cornelius II, Cornelius 2 or Thomas Cornwallace. I call him "lost". Sometime between Thursday night and this morning the snake got out of his cage and is nowhere to be found. We've spent the last two hours searching cabinets, under the refrigerator, in the floor grates, and behind the furniture. According to the internet "lost" snakes can live in your house for months before they turn up. I guess I better hold off advertising "Free: 223 pinkie mice" on Craig's List, again.. BREAKING NEWS, BREAKING NEWS! ALERT, ALERT! Miraculously the snake has been found! We set a trap that included putting a warm, wet towel on the floor next to the wall with the theory the snake would be drawn to the warmth and moisture in the towel. The next morning we left for Florida and didn't even look under the towel because I didn't think the trap stood a chance of working. Today would have been my dad's 74th birthday. He's been gone five years and I miss him now more than ever. It's interesting to me because there was a time in my life when I didn't need him and I didn't miss him when it was months between visits. Somewhere along the way though, things changed, I did miss him and I did need him. I became a parent myself and for the first time I understood him a little better. I understood that parents are only human, with their own lives, their own successes and their own failures. I focused a little too much on his failures for too long. Once I embraced him for who he was, our relationship deepened. I'll never forget the love he had my for kids, how he told me he was proud of me over and over, how he taught me to finally catch a fly ball when I was 42 years old, and how he was still trying to give me advice until the end. I remember giving him a hard time in the hospital because he was trying to give me directions home from New Jersey; a trip I had driven dozens of times. He said "I'm your father, it's what I do." So I let him. The last words he ever said to me were "I love you, very, very, very much." It doesn't get any better than that. I love you too Dad, and miss you so much today and everyday. Truth be told I've been going to country auctions since I was a kid and it's probably because of my mother I love them so much. When I was about eight years old my mom took my siblings and I with a friend of hers to an auction in Pennsylvania run by the local Amish community. They sold all kinds of things, furniture, baked goods, livestock, etc. If you've never been to one you really should go because they're great fun. The only problem with an auction is that sometimes you can really get caught up in the moment. To say my mother got caught up in the moment once would be an understatement. I remember the auction was out in the country, in a big red barn and there were hundreds of people there, farmers, families, and lots of members of the Amish community. Even as a kid I was fascinated by the auction. It's really cheap entertainment to watch who buys what, listen to the rapid fire chant of the auctioneer, and to make sure you don't bid on something you don't need like an antique meat grinder or some other crazy thing. Like a pony. Even if it is the most beautiful pony you've ever seen. Now buying a pony at an auction is probably a really smart thing to do under certain conditions, i.e., 1) you live on a farm, 2) you actually have the money to buy and feed a pony, or 3) you're not buying it because your kids think it's "so cute"! And just so you understand, my family lived in the city, we didn't have a barn, we barely had enough money to pay the bills and shouldn't have been pleading with my mother to buy us a pony. But we did. And she bid! And she kept bidding and bidding until it looked like we were really going to be the proud owners of that pony. In my mind I had already named her Skipper, knew she'd be happy living in our garage and saw myself feeding her delicious red apples from the tree in our backyard. We couldn't believe our (usually) sane mother was actually bidding on a pony for us, and were jumping up and down with excitement! I remember thinking, "Dad's not going to like this! ", but trusted my mother had a plan and knew what she was doing. It was all so crazy and unbelievably wonderful! We were going to have our very own pony! And that's when my mom's best friend, "Aunt" Darla stepped in. She literally grabbed my mother by the shoulders to shake some sense into her and made her stop bidding for our pony. We looked on in horror as we realized our dream was slipping away! Skipper! My mother tried to keep bidding, and struggled valiantly to raise her paddle just one more time, but Aunt Darla was just too strong! She forced my mother's auction paddle from her hand and restrained her until the bidding stopped. Next thing I knew the auctioneer pounded the gavel, pointed to the Amish family sitting near us, proclaimed them the high bidder and awarded them the pony. Our pony. Beautiful Skipper. (Did I mention she was chestnut color with a snow white strip of hair just above her nose?) And just like that, the dream, that never even had a chance to grow, was over. Alas, we didn't get the pony but I'll never forget my mother wanted to give us that pony. Now that I'm a mother myself I completely understand a mother who so loves her children she can easily get caught up in the moment! And that still means everything to me! Ever since that first experience at the auction I've been hooked. When my husband and I were newly married we lived in military housing not far from a large Amish community on the east coast. It wasn't long before I found myself at the weekly auctions held by the various Amish and Mennonite communities. The thrill of the auction is that you never know what you'll find, each week is different. We now live about an hour's drive from one of the best weekly auctions on the east coast. Dixon's Furniture Company in Crumpton, Maryland holds an auction every Wednesday, 51 weeks out of the year. It's amazing. There are simultaneous auctions being conducted on three football size fields and in an enormous indoor warehouse. The amount of stuff being sold is staggering and the cast of characters frequenting the auction is just as interesting. Antique dealers, junk dealers, and homeowners from as far south as North Carolina and north to Vermont converge on tiny Crumpton every week. Victorian style sofa sold for $80. Don't you think it would look fabulous recovered in linen and painted out in a soft cream color? I think this old wash tub would be fabulous filled with ice, beer on one side and wine on the other for a party. I think it went for $40! Four stenciled chairs went for $40. A dealer told me these came off the top of old barns. They went for $480 for the pair. $40 for a sweet painted table. An example of the "you never know what you're going to find" rule! This is one of a pair of carts. I think it would be cool in the right space topped with an old board and used as a buffet. They sold for $125 each. Check back tomorrow, and you'll see some things I picked up at Crumpton, including my all time favorite; "Pearl". Okay, this whole blogging thing is TOO much fun! Not only do you get to write about whatever you want whenever you want, there are people who actually give awards for it! Check out my first blogging award! 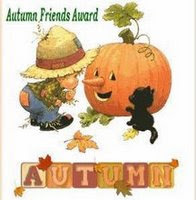 One of the things I've learned in my two weeks of blogging is that fellow bloggers often hand out "awards" to blogs they like and "The Kramer Angle" just got its first award from Tardevil at www.confessionsofa40-somethingmamaqueen@blogspot.com. Be sure to check her blog out - especially the title - you gotta love it! Somehow she found "The Kramer Angle" and has sent me the sweetest e-mails about my blog and has been so helpful with blogging tips. Thank you Tardevil! Now I need to pass it on to some of my favorite bloggers! I told you in my previous post about the great baseball themed party we had to celebrate the publication of Jeff Potter's new book, Whatever Happened to Baseball? (available at Amazon.com - yes, that's a shameless plug!) 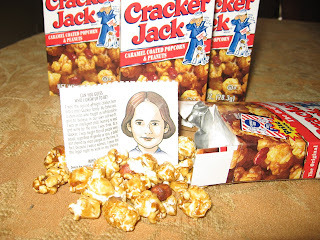 Who knew a book signing party would lead me to ponder "Whatever Happened to Cracker Jacks?" Anyway, have you ever heard of a memory jar or jug? If you're lucky you can find them every now and then in antique shops or folk art galleries. Memory jars are vessels that were made by placing everyday items such as tokens, bits of jewelry, shards of pottery, etc., into a clay that covered a jar, bottle or crock. I found out online that some experts think memory jars have their roots in Southern Black communities where they were placed in cemeteries for use as grave markers. 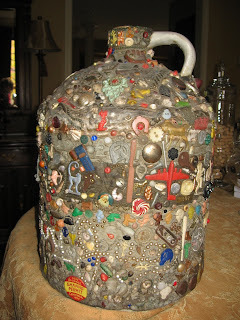 The vessels were covered with trinkets that belonged to the deceased person. There's even the theory that memory jugs were in a sense the precursor to scrapbooks and started during the Victorian era where "sentimentality reigned". Whatever their start, my husband's grandmother had one and he and his brother have fond memories of looking at it when they went to visit Grandma because they never knew what would be pressed into it on their next visit. In fact, Grandma used to let them press the prizes they got out of Cracker Jack boxes into the clay when they visited. I found out on the official Cracker Jacks website they were "first invented in 1893. According to legend, a unique popcorn, peanuts and molasses confection that was the forerunner to Cracker Jack caramel coated popcorn and peanuts was introduced by F.W. Rueckheim and Brother, at the World's Columbian Exposition, Chicago's first World's Fair. Then in 1896 Louis Rueckheim, F.W. 's brother and partner, discovered the process for keeping the molasses-covered popcorn morsels from sticking together. Louis gave the treat to a salesman who exclaimed, "That's crackerjack!" "So it is," said F.W. Rueckheim, who then trademarked the words." "Then, in 1908 the song "Take Me Out to the Ball Game" was written by Jack Norworth, who wrote the lyrics during a 30-minute subway ride, and Albert Von Tilzer, who composed the music. Cracker Jack brand was immortalized with the third line, "Buy me some peanuts and Cracker Jack." Finally in 1912 a marketing genius decided to put a A Prize in Every Box" and toys were inserted into every package. That's not a prize; it's history class. Can you imagine trying to make a memory jar out of those "prizes"? Someone please tell me, "WHATEVER HAPPENED TO CRACKER JACKS?" Hi sports fans! Have you ever wondered whatever happened to baseball? I bet you're like most people and never knew there was anything wrong with it! My husband and I had a really fun book signing party for Jeff over the weekend. He spoke to the group about his experiences, and then autographed some books for his "fans". (You can't have baseball without baseball fans!) I had a great time planning the decor and just played off the whole baseball theme. I had lots of Cracker Jacks, peanuts, sunflower seeds and big league chew displayed in fabulous apothocary jars. For the dining room table I filled a large, rusty wire urn with old baseballs and stuck an American flag in it. We even had lots of great baseball food; hot dogs and plenty of icy cold beer! Have you ever wondered "Whatever Happened to Cracker Jacks"? I've been thinking about that a lot lately, and I'll show you why tomorrow.